Heat oven to 350°F. 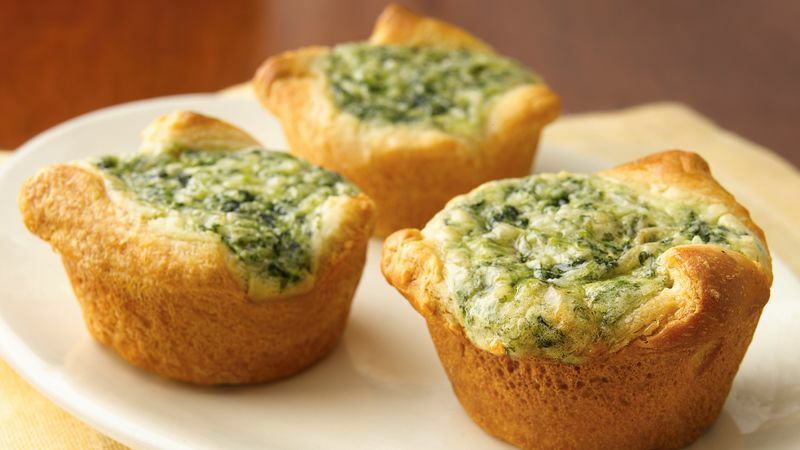 Spray 16 (2 3/4x1 1/4-inch) muffin cups with CRISCO® Original No-Stick Cooking Spray. Separate each can of crescent dough into 8 triangles. Press 1 triangle on bottom and up side of each muffin cup. In large bowl, beat cream cheese with electric mixer on medium speed until smooth. Add eggs, one at a time, beating well after each addition. Stir in onion, spinach, salt and pepper until well mixed. Fold in cheese. Fill each cup to the top with egg mixture (do not overfill). Bake 15 to 20 minutes or until knife inserted in center comes out clean and edges of rolls are golden brown. Remove from pan. Serve warm.